Churchward preferred locomotives without trailing wheels, to maximise adhesion on the South Devon banks of Dainton, Rattery and Hemerdon on the West of England mainline to Plymouth, then the Great Western’s most important route. Due to the weight and dimensional restrictions required to pass over all the GWR’s lines, he designed narrow fireboxes, but with good circulation. Combining high boiler pressures with superheating made efficient use of the high calorific-value steam coal from the mines in South Wales. Other refinements included feed-water distribution trays beneath the top-fitted clack boxes to minimize boiler stress and large bearing surfaces to reduce wear. Churchward also made advancements in carriage design. He introduced the GWR’s first steel-roofed coaches and is also credited with introducing to Britain several refinements from American and French steam locomotive practice. Among these were the tapered boiler and the casting of cylinders and saddles together, in halves. His choice of outside cylinders for express locomotives was also not standard in Britain for that time. Many elements of British practice were retained, of course. His locomotives for the most part used British plate frames, and the crew was accommodated in typical British fashion. The selection of a domeless boiler was more common to Britain than to the U.S. In 1922 Churchward retired, and C. B. Collett inherited his legacy of excellent, standardised designs. These designs influenced British locomotive practice to the end of steam. 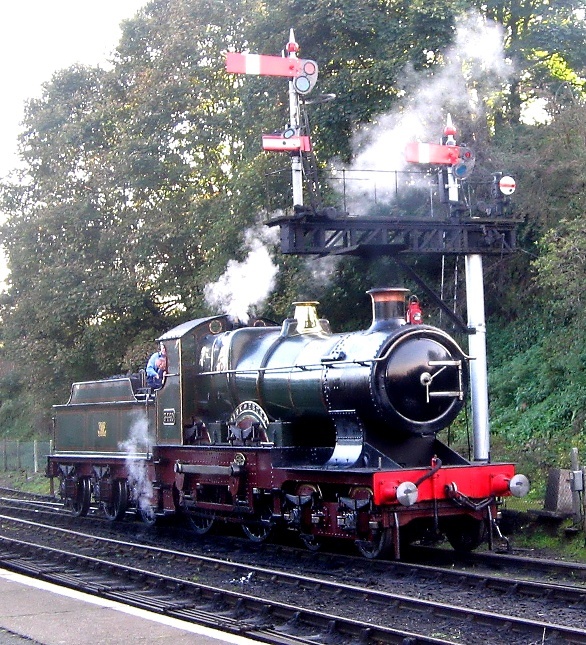 Major classes built by the LMS and even British Railways 50 years later are clearly developments of Churchward’s basic designs. The LMS Stanier Class 5 4-6-0 and the BR standard class 5 are both derived from his Saint class early examples of which date to 1902.